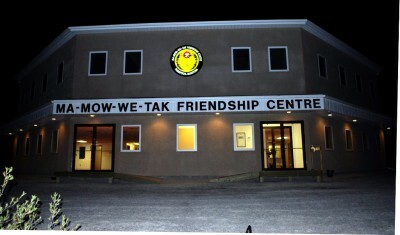 Our 20,422 square foot Friendship Centre main facility, constructed in 2010 is located on 4 Nelson Road and offers our programs & services under one roof. With everything from administrative, employment, cultural, and educational services to our New Beginnings and Youth Site programs our Friendship Centre serves as a “One Stop Shop.” We are wheelchair accessible including an elevator to access both floors. The bright and spacious boardroom accommodates 20 people comfortably, equipped with a flat screen television and sound system for professional quality presentations. We also have a Multipurpose Room with a seating capacity of 200 people equipped with a remote control projection screen and a state of the art sound system with infrared gooseneck and hand held microphones.